Shortly after Barack Obama first took office, he famously admitted at the Summit of the Americas that Washington needed to use diplomacy in “more intelligent ways” in Latin America and beyond. Now, with his administration’s groundbreaking normalization of ties with Cuba, he seems to be finally making good on that pledge as his final term nears it end. As the two countries opened embassies in each other’s capitals for the first time in over 50 years, regional leaders unanimously praised the news. In much of the U.S. media, the event was portrayed as an easing of Cuba’s decades-long isolation. But in the region, at least, it’s Washington that’s been isolated — including for the last seven years of the Obama administration. And it’s not just because of Washington’s lonely alienation from Cuba. “We don’t have to be imprisoned by the past,” Obama said about the need for a new approach to Cuba. He was referring most directly the last five decades of U.S. policy toward the island. But for Latin Americans more broadly, that history is widely understood as one in which the United States, especially throughout the 19th and 20th centuries, dominated its regional neighbors by propping up governments aligned with its own economic and political interests. This included allying with brutal military dictatorships, which often came to power by violent coups against democratically elected governments. Based on this history, explains Harvard professor Steven Levitsky, “alarm bells ring across the political spectrum in Latin America” whenever coups occur in the region. Washington is always a suspect. In 2002, for example, alarm bells rang as the hemisphere’s first coup attempt since the end of the Cold War took place in Venezuela. The coup carried out against Venezuelan President Hugo Chavez ultimately failed when loyal sections of the armed forces, spurred into action following widespread public outcry, detained key coup leaders and returned Chavez to power. Before it unravelled, the coup government received the Bush administration’s full endorsement. Suspicions of U.S. involvement, which ran rampant at the time, were later confirmed when evidence showed that U.S. officials not only knew of the planned coup, but had actually authorized it. During Obama’s tenure, Washington has been less willing to intervene in the direct manner of previous decades, or even to endorse coups as brazenly as Bush did with Venezuela. Yet two successful coups have been carried out in the region during Obama’s presidency, and his administration’s response has done little to improve Washington’s reputation. The first coup took place in Honduras in 2009, when then-president Manuel Zelaya was kidnapped by the military and flown out of the country. In protest, most Latin American nations and the entire European Union severed ambassadorial ties with the Central American country. The Spanish prime minister branded the move “illegal,” while Argentina’s President Cristina Kirchner called it a reminder of “the worst years in Latin America’s history.” International groups, including the Organization of American States and the United Nations General Assembly, called for Zelaya’s immediate return. Although Obama did call for Zelaya’s return, the United States was one the few countries to retain its ambassador in Tegucigalpa. Furthermore, the White House and State Department strenuously avoided labeling the events in Honduras a coup. Such a designation would have barred the administration from sending military aid to the coup government. Now, thanks to Wikileaks, a cable from the U.S. embassy in Honduras has been released showing that the State Department indeed believed Zelaya’s removal clearly constituted a coup. Subsequent revelations showed that several of the coup’s supporters had ties to then Secretary of State Hillary Clinton’s inner circle. At the time, the administration’s response led the New York Times to comment that it was “often hard to tell if George W. Bush [wasn’t] still president.” U.S. policy in Honduras remained at odds with much of the international community’s, and this continued when the Obama administration supported elections held after the coup — even when many, including the OAS, questioned their legitimacy. Yet the White House prevented the OAS from intervening in the elections. According to Mark Weisbrot from the Center for Economic Policy and Research, this resulted in the creation of the Community of Latin American and Caribbean States (CELAC), a hemispheric group that purposefully excluded the United States. The second coup took place in 2012 in Paraguay, when ex-bishop Fernando Lugo was ousted in what has since been described a parliamentary coup. Lugo was impeached by his opponents and given 24 hours to defend himself following a land dispute that resulted in the death of six police officers and 11 farmers. Highly reminiscent of the fallout after the Honduran coup, Latin American leaders from all political walks of life protested the events. Even Latin governments who traditionally align closely with U.S. policy in the region denounced the move. Chile recalled its ambassador, while conservative leaders from Colombia and Mexico publicly rejected the coup. Every foreign minister from the Union of South American Nations (UNASUR) visited Paraguay in protest, calling the move a clear violation of UNASUR’s democracy clause. With memories of U.S. support for the failed coup still fresh, there was widespread reaction to the strong wording of the order. CELAC and UNASUR rejected the sanctions and demanded their reversal, with CELAC calling them “unilateral coercive measures contrary to international law.” Even reliable U.S. allies like Colombia and Mexico signed the statement in arguably the most unified opposition to U.S. policy in the region to date. Despite the progress of re-establishing diplomatic ties with Cuba, the Obama administration has done little to dispel doubts about Washington’s intentions towards its neighbors to the south. While Obama may have broken U.S. Cuba policy out of the prison of the past, there are many more new ideas waiting to be freed. Until then, Obama may well go down in history as another U.S. leader who worked against, rather than with, Latin America. 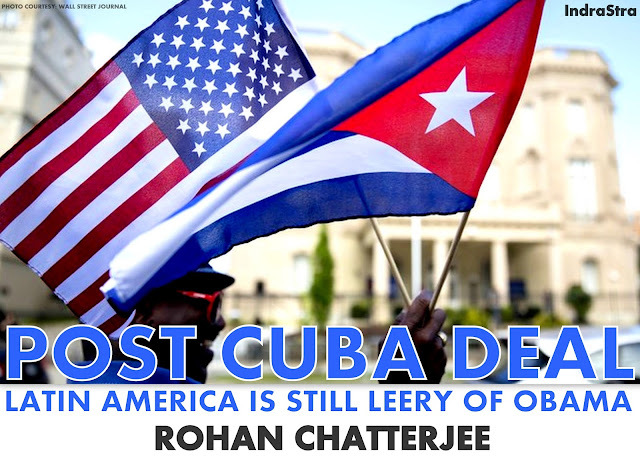 Rohan Chatterjee is an English freelance writer covering Latin American economics and politics. He’s a regular contributor to Puslamerica and Latin Correspondent.